You can manage your home appliances, even from afar. Turn your home electronic on and off from anywhere with APP"eFamilyCloud". With the Smart Plug it is possible to come home to a brightly-lit house with your favorite music playing. Never leave lights on, or devices running again. Powerful and Safe: FCC, CE, RHoS approved for safety and quality assurance. 1.The Smart Plug configuration works on 2.4GHz WiFi, so please check that your phone is connected to 2.4GHz WiFi before using the app. 2.Please do not use the Smart Plug in the electric blanket. 3.Please do not connect to any house hold appliances over 2000W. Please contact us first when you have any problem, our team is here 24/7 for toll-free technical support. Works with Amazon Alexa, IFTT and Google Assistant: Control your home with the power of your voice. Use simple voice command to turn On/Off your lights and appliances. 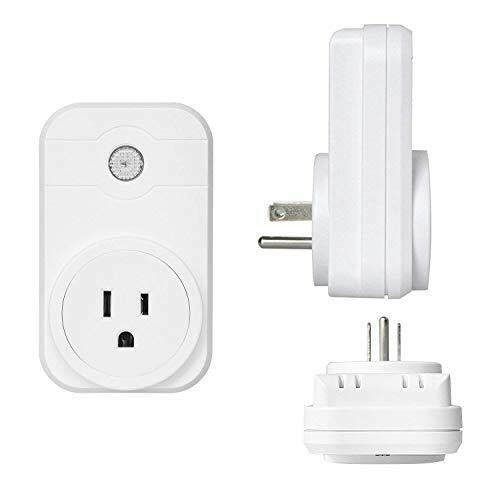 WiFi Smart Plug: Control your electrical items via your phone whenever and wherever you are after downloading the FREE APP(small space)as long as there is a network.Ideal for someone who can not move around very well and needs easy access to turn on/off a device. Smart and Easier Life: You can set schedules and timers for the A/C units,you can prepare a crockpot meal and get home with dinner's ready, or turn off your nightstand light after falling asleep. Time Switch: Supports setting up timing task and repeat ON/OFF cycle daily for lamps. Your lights will turn on and off according to your schedule to confuse potential intruders and make it look like somebody is home. Easy to Install and Safe: Just plug a device into the wifi outlet and connect to your Wi-Fi network with APP "eFamilyCloud". UL listed, CE, FCC, RoHS, reach Approval. Smart plug is backed by 90 day unconditional full refund guarantee and 12-Month limited warranty. If you have any questions about this product by Annstory, contact us by completing and submitting the form below. If you are looking for a specif part number, please include it with your message.